Not really, because while Valentine’s Day does celebrate love in a big way, simultaneously around the world, it is a holiday that also points out the various definitions of love, the way love is expressed, received and cherished. It is after all, an honor to love someone and a be loved, celebrate it one day of the year or every day of the year, as long as it is something that empowers the best version of ourselves to be projected upon the world! Happy Valentine’s Day to everyone, hope it’s full of sweetest moments and unforgettable, precious memories. 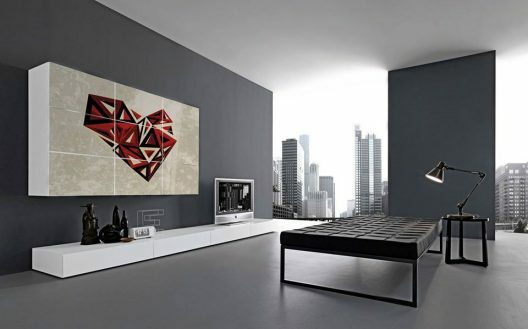 Presotto celebrates Valentine’s Day with a personalized paneling system that could be easily applied to cabinet doors of its I-modulART modern wall unit collection to celebrate love, send, highlight or communicate any other tailored message. It’s Super Bowl Eve y’all!!! And Philadelphia is all lit up in tribute to the Eagles whose journey to Super Bowl LII is truly inspiring. The city’s most recognizable landmarks like Boathouse Row, Benjamin Franklin Bridge, City Hall, Children’s Hospital of Philadelphia and practically the entire city skyline is glowing with green pride in colorful salute to their home team’s road to the 2018 Super Bowl. 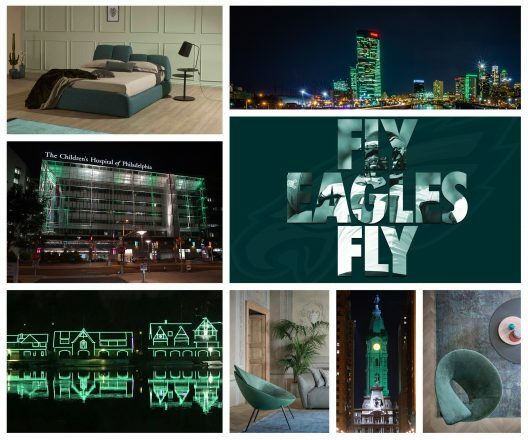 But just in case Eagles green love extends beyond the Super Bowl, know that this shade of green is also known as midnight green and is a powerful yet chic color with modern inclination and organic disposition. Midnight green is a color that can easily energize and brighten without appearing ostentatious because of its strong ties to nature, while coming across extra sharp because of its vivid cool, cyan undertone. For inspiration and for very pretty modern furniture pieces if you are an Eagles fan, examples of perfectly applied Eagles Green include the Lock armchair by Alessandro Busano for Bonaldo and the Tuny leather bed by Tonin Casa, both of which embody this gorgeous color with serenity and sophisticated taste. Royal blue is a deep, highly saturated darker version of blue. 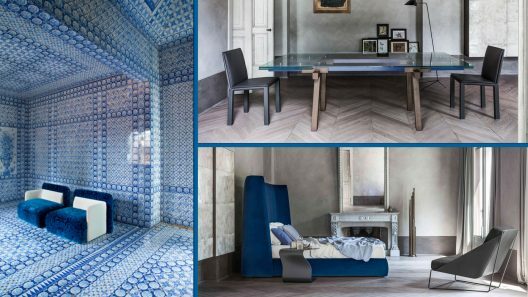 Opulent in hue and suggestive of unequivocal elegance, it is hard not to ponder which particular royal this shade of blue was intended for. 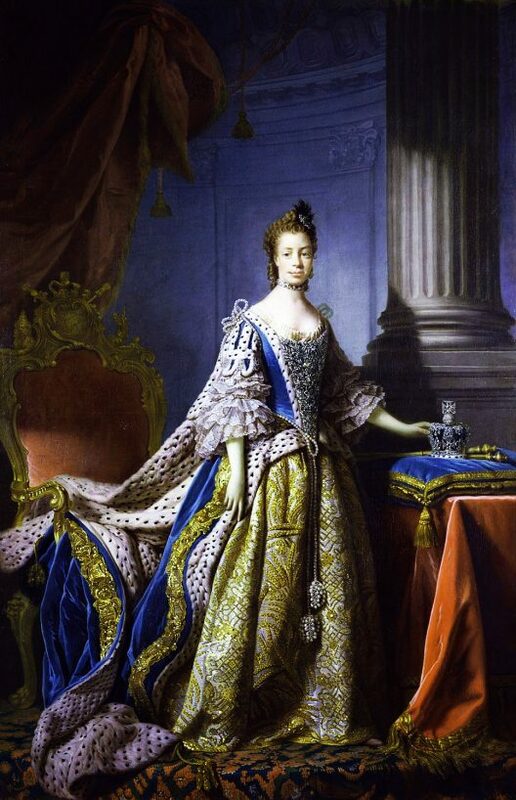 Dating back to British Monarchy of late 18th and early 19th century, a blue dress was made for Queen Charlotte who ruled England with King George III. The rich colored fabric drew the queen’s attention when it was presented by millers from Somerset, affixing the term for eternity as royal blue. Forever to be associated with regal sophistication, this spectacular shade makes everything appear more lavish. From the mega impressive Basket Alto bed by Mauro Lipparini for Bonaldo that is intentionally upholstered in a royal blue velvet to add theatrics, to the ultra-modern Track dining table by the brilliant Alain Gilles which despite its minimalist profile manages to offer unparalleled flair when its steel beams are showcased in a royal blue color. Proving that this color is also never too much is a chromatically layered eclectic space that features a pair of beautiful Log accent chairs by Didier Versavel for Desio on top of entirely tiled walls, floors and ceilings. 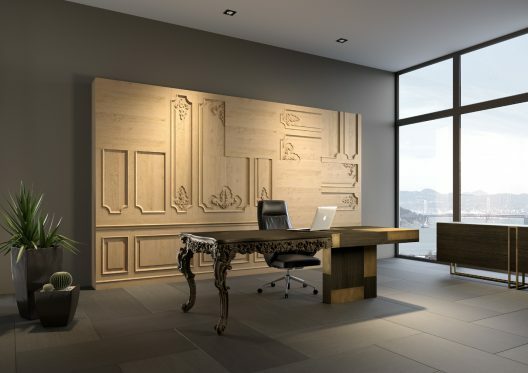 Another masterpiece with a highly expressive visual presence is the Evo office desk by Emmemobili. 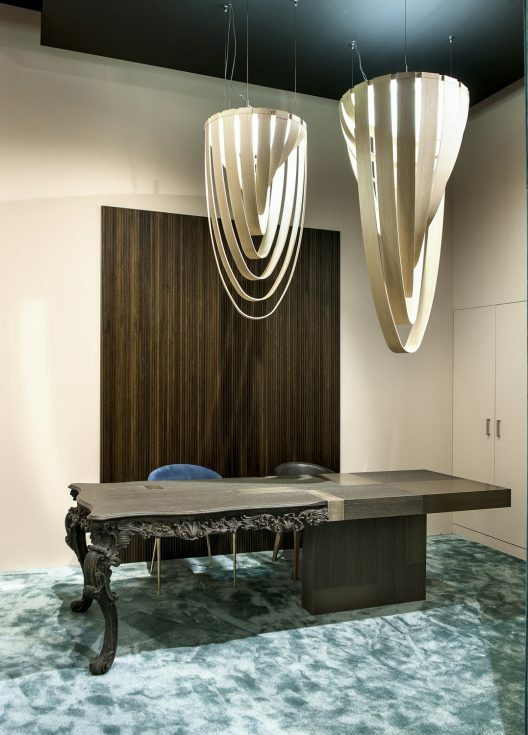 Inspired by the original hybrid of styles, that realized the progression of design spectrum from archaic to modern in the most literal of ways; Evo desk pays a verbatim homage to the Evolution sideboard and to the play on artistic side of contradictions. 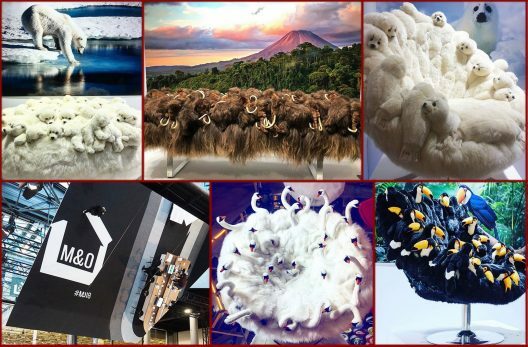 The 2018 Maison & Objet fair in Paris bore witness once again to the creativity and thoughtfulness displayed by stuffed animal furniture by AP Collection. 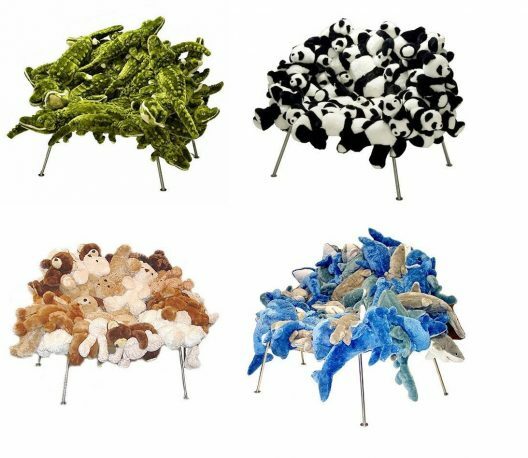 Inspired by a personal story of Alexis and Pauline and perhaps by the reinvention demonstrated by Fernando and Humberto Campana’s limited edition series of Banquet chairs, AP Collection’s 2018 presentation included polar bears, swans, mammoths, seals, and toucans. 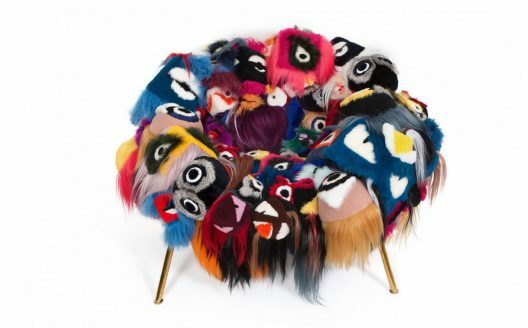 Similar to the Campana Brothers 2003 stuffed animals that were repurposed into modern furniture through repetition, clustering and playfulness and their more recent addition of the Armchair of Thousand Eyes for Fendi Casa, AP Collection embraced sculptural aspects of cushy toys by inserting them into modern interiors through functional furniture like statement-making benches and eye-catching ottomans in addition to their initial collection of accent chairs.